Operant conditioning is the process by which animals, including dogs, learn to change and modify their behaviour. We’ll go into that in a minute and hopefully all will become clearer! Many traditional gundog trainers view operant conditioning as a ‘fashion’ or ‘fad’ in dog training. Something you can ‘choose’ to use, or leave to one side. In fact, operant conditioning is a process that occurs all the time. Whether we are aware of it, actively use it, or desperately try to avoid it! It is inescapable. It even takes place when you are not there. The term ‘operant conditioning’ refers to a ‘law’ or ‘rule’. It simply describes the process through which animals modify the way they behave tomorrow, in response to the outcome of that behaviour today. In the same way the law of gravity might describe what is happening when you drop an apple. What is great about operant conditioning, is that if you understand it, you can control it. At least, some of the time. And with regard to your dogs. It isn’t the last word in dog training, but it is something we can all benefit from understanding. Operant conditioning is a well-studied process. The principles of operant conditioning have been known and understood for many years now and if correctly applied can produce reliable, repeatable results in training a wide variety of species including ourselves! Operant conditioning explains how the immediate consequences of an animal’s behaviour have the power to alter that behaviour in the future. This enables an animal to learn from and make use of, the natural environment in which it lives. The process is described in scientific terms and the terminology used can be confusing to begin with. Words like punishment and positive, have a different meaning from that with which we are familiar. All is explained below. Nothing makes traditional gundog trainers more annoyed than to be told that they are punishing their dog. Especially when they didn’t even lay a finger on him! Whenever there are misunderstandings and disagreements on my Positive Gundogs Facebook group, you can be pretty sure that the word ‘punishment’ features in there somewhere. In layman’s language, punishment can mean all kinds of things. And no two people will ever agree on what defines a punishment, though most think it involves hurting a dog. Because the word punishment has so many meanings it is helpful if we dog trainers stick to the true meaning of the word punishment, as a behavioural term. The true meaning of punishment is beautifully clear, observable, and measurable. Which makes it a really useful word. Anything which makes a behaviour less likely to occur in the future, is defined as a ‘punisher’ and the application of that punisher is defined as a punishment. The punishment does not have to be painful or violent, or harsh at all, for it’s application to be defined as a punishment. All that is required is that it makes the behaviour accompanying it less likely to re-occur. This means that the animal receiving the punishment must find it aversive. Understanding this is important both with animals and people. A punishment is not defined by how harshly the provider of the punishment regards it, but by whether or not the subject (in this case a gundog) we are imposing it on finds it aversive and to what degree. What is a ‘punishment’ for one dog, may not be a ‘punishment’ for another. Nor is a punishment defined by the intention of the person supplying it. Letting a firework off may not be intended to be a ‘punishment’ by your neighbour, but if it frightens your puppy whilst he picking up a ball for example, strictly speaking the puppy has been punished for grabbing the ball and he will be less likely to repeat the behaviour in the future. When we refer to punishment in the context of training, it is this definition which we are using. Some people that punish dogs are of course cruel. But most people that use punishment today are not. They may not be positive-only trainers, but they are not intending to cause, or succeeding in causing, physical or emotional harm to the dog. And when a modern dog trainer, tells a traditional dog trainer that he is using punishment, this is in no way an accusation of cruelty. It is simply an observation that the trainer is applying a consequence which will diminish that particular behaviour. It is important that we are able to make this distinction, because increasing numbers of gundog trainers are now training their gundogs without using aversives at all, and more are joining them all the time. This is an exciting new movement which is in its infancy in the gundog community, but is achieving some great results already. Reinforcement is the other side of the coin. 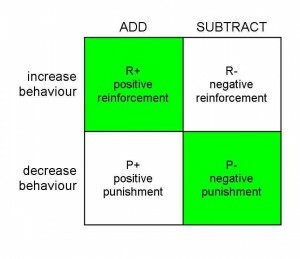 Anything which makes a behaviour more likely to occur in the future, is defined as a reinforcer, and the application of the reinforcer is defined as ‘reinforcement’. This is not the same way in which many trainers use the word reinforcement when it is often used simply to mean ‘going over’ training until it is thoroughly understood. I have become involved in some very muddled conversations talking to gundog trainers who talk about ‘reinforcing’ their dog’s learning when they actually mean repeating exercises or drills until the dog ‘gets it’. Reinforcement, like punishment is defined by the dog, and by its effects, not by what the handler thinks ought to be reinforcing. So, if your dog doesn’t find having his ears rubbed reinforcing, it won’t improve the chances of him repeating the sit you just asked for. Getting your head around this is a big advantage for any dog trainer who wants to train more humanely, as effective reinforcers make learning a breeze, and ineffective reinforcers inevitably lead to punishment. In layman’s language, we often describe reinforcers as ‘rewards’ . A reinforcer can be anything the dog finds pleasurable, it does not need to be food, it can be toys, games, a retrieve and so on. We are very fortunate in that much of the work carried out by our gundogs is intrinsically rewarding thus continually reinforcing their behaviour without us having to constantly think of ways to do it artificially. However, in the early stages of training, before dogs get onto fieldwork, it helps if we can be inventive about ways to provide rewards, because it has now been shown beyond doubt, that some of the consequences we thought were rewarding to our dogs (like verbal praise) are actually not rewarding at all and don’t reinforce the dog’s behaviour. You’ve probably heard of Positive Reinforcement – which is what force free trainers use to create and maintain behaviours in their dogs. This is another huge source of confusion. Some traditional gundog trainers refer to themselves as ‘positive’ trainers, because they are kind to their dogs, use plenty of rewards, and work with their dogs in an upbeat and positive way. Unfortunately, this is not what positive means in dog training. And like the layman’s use of the word punishment, it isn’t a very helpful one, because positive used in this way means different things to different people. There is much less confusion all around, if we use the behavioural meaning of the world positive. The key is to remember that this ‘language’ was designed by scientists, and when they talk about positive and negative they are talking in the mathematical sense of adding or subtracting. Not about feeling great or grumpy! Positive reinforcement is where something that the dog find pleasant, has been added to his environment. Like a catch of a ball, or a piece of chicken. Positive punishment is where something (which the dog finds aversive) has been added to the dog’s environment whether it be a gesture, a word, a glance, or a slap. In correct training terminology, these are all punishments. It takes a while to get used to this linking of the words punishment and positive. Especially if you are still thinking of the word positive as meaning cheerful or happy. But don’t worry, if you keep on using the correct terms they will soon seem normal and you’ll wonder why you ever thought them strange. A negative punishment is where something pleasant to the dog has been subtracted or ‘taken away’. Usually by preventing the dog from having access to it, for example, using a long line to remove the opportunity to chase. Force free trainers use negative punishment in this way. A negative reinforcement is where something unpleasant has been taken away. Negative reinforcement is rarely used in UK gundog training but is common in the US and forms the basis of the ‘force-fetch’ programme widely used in American retriever training. Negative reinforcement is controversial because in order to remove the unpleasant stimulus (pain for example) the handler must first apply the unpleasant stimulus to the dog. Usually in the form of an ear pinch or toe hitch. 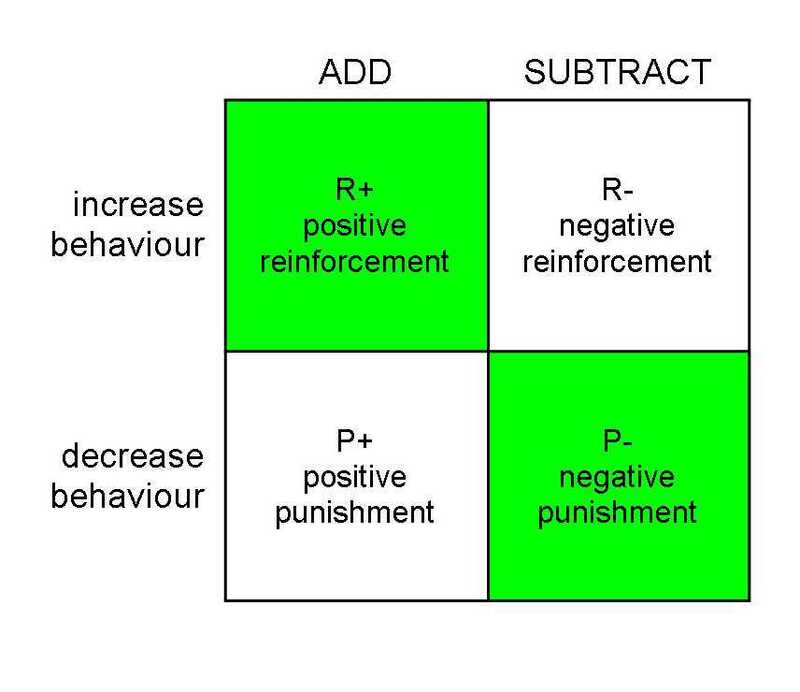 You can see now that with the option for both positive and negative punishers and reinforcers, we have four different types of consequence to apply to a dog’s behaviour. Extinction is vitally important to clicker trainers. It is a process that describes the complete disappearance of a behaviour. The process has been thoroughly proven and tested. Extinction occurs reliably when an animal is neither rewarded nor punished for a particular behaviour. In other words if nothing changes, if there is no consequence to a behaviour, that behaviour will die out. Many traditional gundog trainers find it laughable to assume that if you ignore an unwanted behaviour it will disappear, they have seen for themselves that unwanted behaviours get worse. However, this is not because extinction does not exist, but because many unwanted behaviours DO have consequences. They are inherently self rewarding. Extinction is a very difficult phenomenon to make use of in the field because of the environmental factors that the handler cannot control. Nevertheless, extinction is a real process and can be useful in an environment where the handler has complete control – in the home for example or in a confined pen. If the first outcome occurs that dog will be more likely to repeat the behaviour in the future. If the second or third outcome occurs he will be less likely to do so. There will be one of these outcomes or consequences to any behaviour exhibited by your dog. Whether or not you are there. If you want to control the way your dog behaves in the future, you will need to take control of the consequences of his behaviour in the present. This can be quite challenging at times! 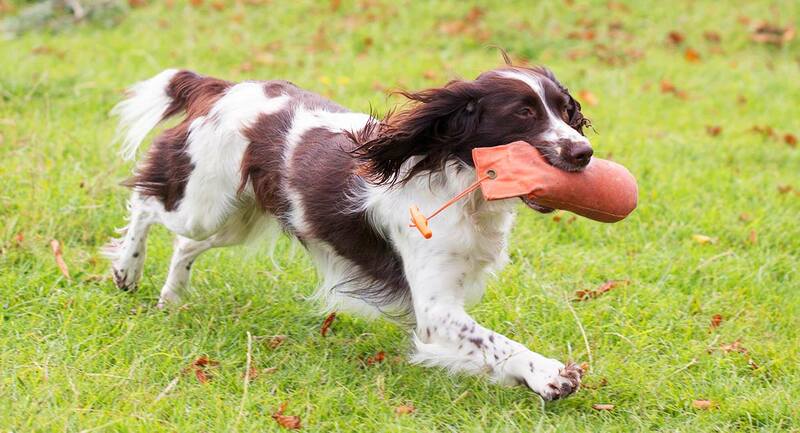 Learning the language of dog training is vital if gundog trainers are to move with the times. The language of behavioural science has become the international language of dog trainers. It is recognised and understood all over the world, and it is important that the gundog training community doesn’t get left behind. It’s force free and fun. 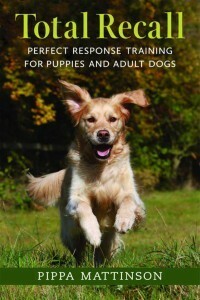 It explains how dogs learn and how you can change your dog’s behaviour through operant conditioning. All in plain English. The term Diminisher/Diminishment should now be used instead of the defunct term Punisher/Punishment because it better describes the phenomenon. I understand Operant Conditioning is also the environment acting on the individual.